A few weeks ago, my friend Sanober Mukadam and I gave a talk at SXSW. This was my third time speaking there, and each time it gets bigger and better. I organized a panel on the future of mobile games back in 2003 (good call). In 2007, I moderated a session on voice communications in virtual worlds (not so good, but at least I was there for the Twitter launch). In keeping with my ongoing tradition, and resonating with the conference’s increased interest in startup content, I decided to do something different. I called Sanober and pitched her on the idea of a two-person play – a modern boy-meets-girl story set in a business context. Sanober was the main decision maker at Groupon when Yesware struck our first deal with them. The idea behind the talk was that we would use this shared experience to create a “based on a true story” talk that extracted the lessons we both learned from the process for the benefit of other startups trying to sell to bigger companies. By peeling back the process of an enterprise buyer, I thought we could benefit the audience in ways I’ve rarely seen done at conferences. Here’s a link to a version of the script. We used this as a jumping off point for discussion, but much of the content of the formal talk is embedded. My real point, however, is what I personally learned from writing this talk with Sanober. I’m going to jump right to the first meeting I had at Groupon. It’s Chicago in July. This is by far the biggest opportunity we’ve had at Yesware. I’ve left my co-founder and five engineers in our two bedroom apartment/world headquarters in Cambridge MA. I’m nervous. I remember walking into the room and realizing that there are more people here than I imagine. We go around and introduce ourselves. One of Groupon’s founders is in the room. WHAT? I go into my slides, get to the demo as quickly as I can, so they can see that it works, and then one of our early users at Groupon starts talking. He’s making the pitch better than I can, so I shut up and let him tell our story. He’s brilliant. The meeting ends, and I go home. “You helped us understand the product landscape – where the marketing products fit in and where the sales products fit in. We didn’t have to do our own research to come to the realization that these products either specialize in the marketing space or the sales space. Because of this slide, we weren’t unrealistically looking for things that didn’t exist. From your own perspective, that really shortened your the sales cycle. In our search process, before we talked with you, we thought we needed all this other stuff, like sending mass emails from a marketing perspective. But then as we did more research, we realized that there are some businesses that play purely in the marketing realm and then there are some that may be more from sales. That’s why your slide was so helpful. With that picture, it was clear. Your job was to educate us about how the market is set up, and you did it well. The lessons for startups is clear: When presenting to big customers, investors or distribution partners, draw a map. Relate your company in a familiar context. By using well known companies and industries in the slide above, I was able to put Yesware into a comprehensible frame of reference for potential customers and investors. Distinguish your company from others. In the diagram, Yesware sits away and below those other bigger firms. 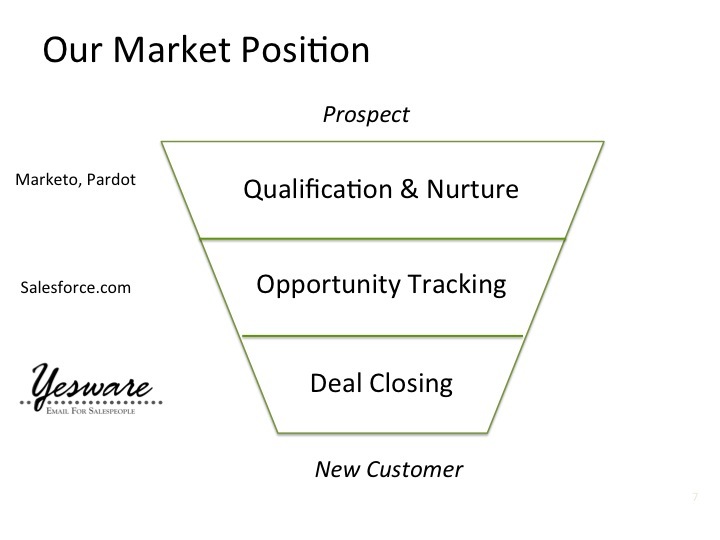 As I talked through the slide (using the “Sales Funnel” framework for explaining how the picture fits together), I always ended with Yesware as the punch line of the slide. We are at the bottom of the sales funnel, helping salespeople close more deals. The narrative and the positioning helped to distinguish us from other better known companies. Make sure your map is relevant. Having a map of Kansas is no good if you are going to Vermont. So make sure that the analogy, the comparative companies, and your relative positioning, resonate with your audience. Public speaking, the questions afterwards and the preparations beforehand, are always illuminating. I’m grateful to Sanober for teaching me something about startups and selling to big companies. I hope it helps you too! This is the 3rd article in our new series with advice on building a business, company culture and startup sales from Yesware Founder and CEO, Matthew Bellows. You can grab all the posts here.